Do Drugged Driving Laws Hurt Medical Marijuana Patients? This map shows drugged driving laws by state, as well as which states allow medical marijuana. The White House has issued a call for every state to make strict drugged driving legislation a priority. What makes this complicated, however, is that for most illicit drugs, including marijuana, there’s no agreed-upon limit that reliably determines impairment. There are currently 16 states that allow the use of marijuana for medicinal purposes, and over a million medical marijuana patients across the country. With three different types of drugged driving laws across the U.S. — and varying state limits for determining impairment from marijuana — depending on which type of law a state uses, a person who is legally allowed to use medical marijuana can be convicted of driving while impaired, even if he or she did not use medical pot on the same day. This is because THC — the main psychoactive element of marijuana (that causes a person to get high) — can be present in the blood of a heavy pot user for several hours or even days, long after any impairing effects of the drug have gone away. And THC-COOH — a secondary metabolite in marijuana that is formed after a person gets high, and that has no psychoactive effect — is detectable in urine for weeks or even months after past use. Effect-Based, Per Se, and Zero Tolerance. Used in 37 states, these laws forbid drivers to operate a motor vehicle when they are either “under the influence” of a controlled substance or if an illegal drug prevents them from driving safely. To convict a driver under an effect-based law, a prosecutor needs to prove that the driver’s impairment or incapacity was directly related to the illicit substance. Prosecutors rely on the evidence that law enforcement officers gather at an accident scene, such as how a driver performs in a field sobriety test, information that a driver was exceeding the speed limit, testimony from a Drug Recognition Expert (DRE), and positive results on toxicological tests showing recent consumption of an illegal drug. These laws are used by four states: Nevada (which has legalized medical marijuana), Montana, Ohio, and Pennsylvania. Forensic toxicologists generally have failed to agree on specific [per se levels]that could be designated as evidence of impairment. The lack of consensus about per se levels of drugs where impairment could be deemed makes it difficult to identify, prosecute or convict drugged drivers in most states. In response to researchers’ failure to define exact Per Se limits for illicit drugs, some states have enacted Zero Tolerance Per Se laws. Zero Tolerance Per Se laws related to marijuana are in use in nine states: Arizona and Michigan (both of which have legalized medical marijuana), Delaware, Georgia, Idaho, Illinois, Indiana, Iowa, South Dakota, Utah, and Washington (although one of those — Arizona — excludes medical marijuana patients from the statute). In their strictest form, these zero tolerance laws forbid drivers from operating a motor vehicle if they have any detectable level at all of an illicit drug or drug metabolite in their bodily fluids. Currently, there are nine states that enforce zero tolerance DUID laws. On the surface, this may seem like a reasonable policy: If you have pot in your system, you shouldn’t be behind the wheel of a vehicle. However, zero tolerance laws can create problems for regular users of medical marijuana because THC and THC-COOH can linger in a person’s blood long after he or she has used the drug. Thus, a person who smokes medical marijuana on one day, could be arrested for a DUID several days (or even weeks) later, even though he or she is completely sober at the time of operating the vehicle. Though billed by its proponents as a necessary tool to crack down on persons who operate a motor vehicle while impaired by illicit drugs, in reality, many newly proposed DUID [driving under the influence of drugs]laws — in particular ‘zero tolerance’ per se laws — have little to do with promoting public safety or identifying motorists who drive while intoxicated. Rather, these laws potentially classify many sober drivers as impaired under the law solely because they were presumed to have consumed a controlled substance — particularly marijuana — at some previous, unspecified point in time. 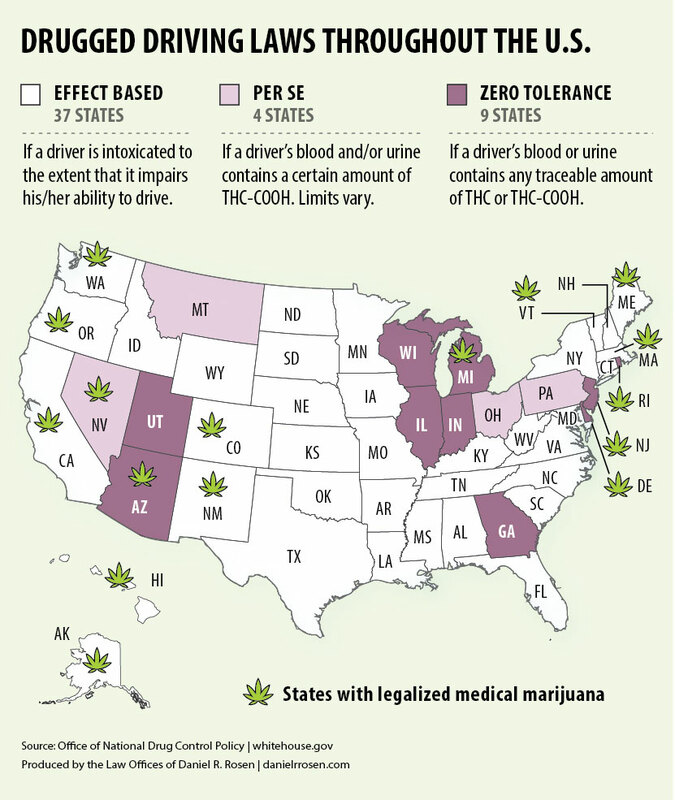 The following chart shows the state limits for THC-COOH in the blood for the four zero-tolerance states and nine per se states. It also displays the typical amount of THC-COOH that will remain in the blood of light to heavy users of marijuana after 20 days without using the drug. 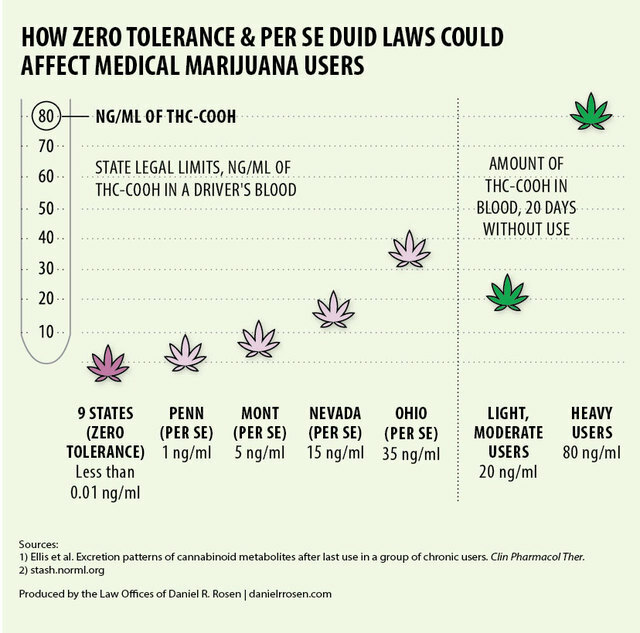 This chart shows varying state limits for THC-COOH in a driver’s blood; and the amount of THC-COOH that typically remains in the blood of light to heavy medical marijuana users 20 days after last use. As you can see, even without using marijuana for as many as 20 days, heavy users of medical marijuana would still be over the legal limit to drive in all 13 states; and light to moderate users of marijuana would be over the limit in all of these states except for Ohio. al marijuana use on the rise, America’s lawmakers need to be careful about where they set the bar.